Was someone trying to get in the door, or out? 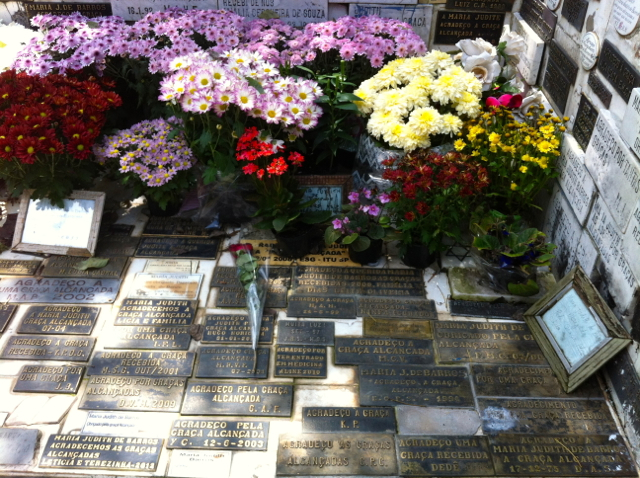 All of these plaques and flowers are a thank you to the person buried inside for helping them achieve a number of things in their life since the person’s death. 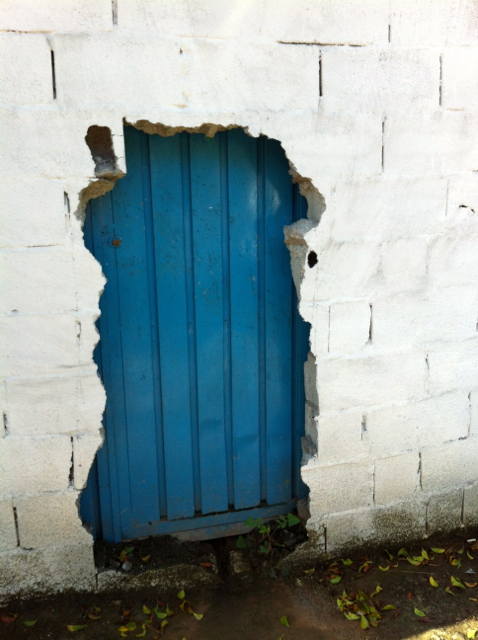 Who is in there? It’s not Jesus. It’s not Gandhi. It’s not Mother Theresa. It’s a woman named Maria Judith de Barros who, according to my internet research, was a woman who endured beatings from her alcoholic husband and died of a degenerative disease. For some reason, people think she can make miracles from the grave. If anyone out there knows more about it – please share. I’m very curious. 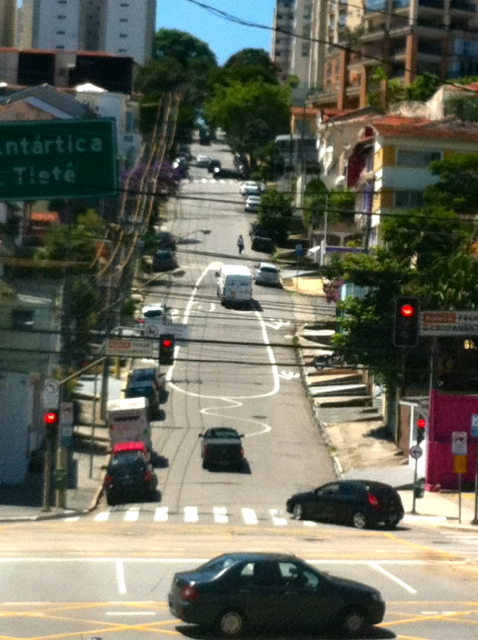 Gallery | This entry was posted in Crazy Adventures, Daily Escapades, Living in Sao Paulo, Tourist Info, What the h*ll is that? and tagged American, brazil, culture, expat, expatriate, life, Maria Judith de Barros, mime crossing guard, mouse in the street, sao paulo. Bookmark the permalink. I love the quirkiness of cities. I couldn’t find more information about Maria Judith. When I went there, one of the old men who works there told us about her history, even on internet. Looks like she’s almost like an urban legend :). I was surprised by the ‘graces’ received by people, a lot of them related to ‘vestibular’ approval. One thing that I learned is that this is not her original grave. 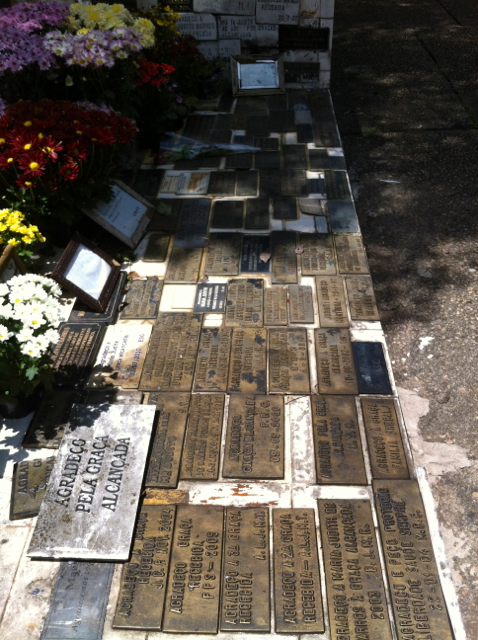 A popular singer called Beto Barbosa rebuilt her grave after he was blessed. Your photos are great! I wonder where Maria Judith is actually buried!! I’ve seen them on Avenida Paulista too – only at the time I didn’t know they were crossing guards. All very nice, i agree! Hello, Megan! I’m Carolina (from Brenda’s house). Loved your blog. And the guards are a CET initiative to call attention to the zebras and help us, brazilians, to change our habits – the ones you must know very well! 🙂 Will come back! Cheers! Thank you!! I’m very happy about that because, as you know, cross walks actually are meant for cars to stop!! Was great to meet you! Come! Come to the dark side! !